I am one of the world's pre-eminent carvers of Norwegian style wedding spoons. I have carefully studied and taken meticulous measurements from several antique sets in my personal collection to ensure that my Norwegian style spoons remain as close to tradition as possible! Using a set of these spoons is probably THE most romantic way a couple can share their first meal (or piece of wedding cake) and begin their married life together!! 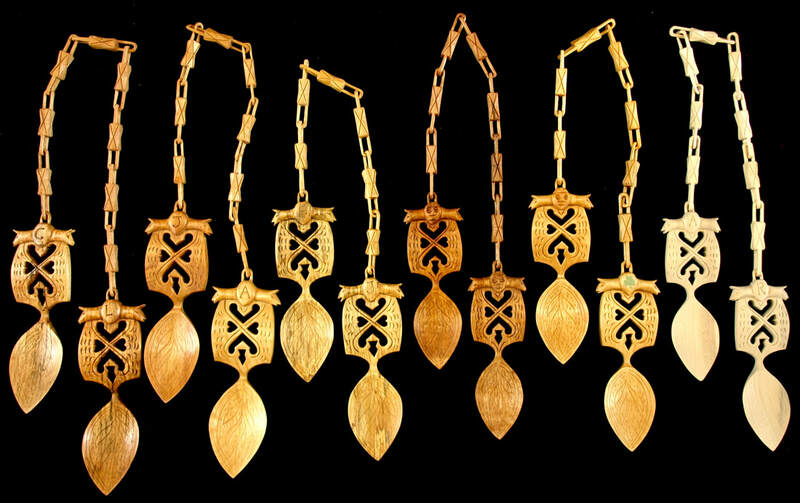 I carve my sets at a range of price points beginning at 250 USD for an unadorned set through to 600 USD for a set with all the 'bells and whistles'. I generally use white birch for historical accuracy, but can also carve them from a range of other North American timbers if requested. Short of finding an antique set through an auction house, I believe my spoons to be the most accurate and beautifully carved wedding spoons on the market. Wedding sets at a variety of prices are shown in the above photo. On the extreme left, an unadorned set sells for 250 USD. In the middle, a set with ornamented chain link and kolrosed bowls sells for 300USD. On the extreme right, a spoon with ornamented chain and 'glibber' faces sells for 350. Prices range upwards from that point if the client requests a domed surface on the handle and/or cranked stems between bowl and handle.